A somewhat strenuous, 2-mile round-trip hike provides access to a couple of excellent slot canyons. One of the slots is easy to hike, the other requires a lot of effort and numerous tight squeezes. In order to get to Spooky and Peek-A-Boo Gulch slot canyons, you have to do a little hiking first. Both of these side-canyons drain into the Dry Fork of Coyote Gulch (which in turn, drains into the Escalante River, which drains into the Colorado). So, to get to the slot canyons, you first must hike down to the bottom of Dry Fork. Here’s a Google satellite image, showing the lay of the land. That trail path is approximate, but I think you’ll get the idea. The hike starts with a quick descent down a hillside. … and I didn’t have any trouble following them on the way down. On the way up, I got lost (along with several other people). If you do everything right, you’ll reach the spot you see above — where the trail makes its final drop down into the Dry Fork canyon. … thanks to a big rock pile at the entrance (and unfortunately, some spray-paint). … you’ll be passing between some beautifully sculpted walls. At first, Spooky Canyon is narrow enough to touch both walls at the same time, but it wasn’t tight enough to make me feel claustrophobic. Depending on the time of day, you’ll be treated to some gorgeous lighting on the canyon walls. Spooky’s floor eventually gets rocky, and the walls get tighter. In fact, from what I’ve read, it gets much more narrow than this. But, I had a limited amount of time, and wanted to explore Peek-A-Boo as well, so I turned around and headed back to the entrance. TIP: You can make a loop out of Spooky and Peek-A-Boo. 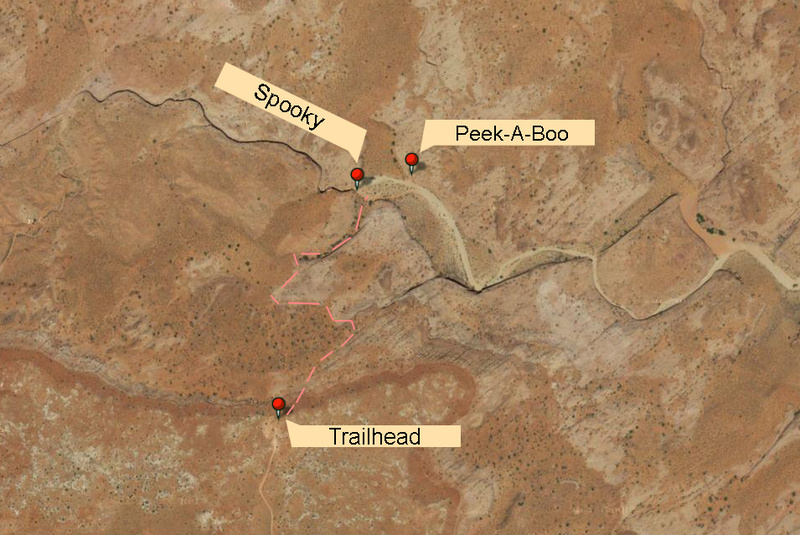 Hike through Spooky until the exit, then follow the footprints in the sand to the top of Peek-A-Boo. Then, climb down Peek-A-Boo, until you’re back in Dry Fork. Peek-A-Boo Gulch is almost hidden. When you exit Spooky, go straight ahead, following a sandy footpath across the ‘island’ of plant life in the middle of the canyon floor. You’ll end up somewhere near this spot. Watch for the crack in the rock, and head towards it. This is what you’ll find: a tricky vertical climb, necessary to enter the slot. Notice the three rounded foot-holds, leading up to that first landing. I’d estimate that’s as high as I am tall — about six feet. Once you’re up there, you’ve got another six feet, give or take, to get up into the slot canyon. It’s not easy — and you might want to take your backpack off, and toss it up there ahead of you. Getting down is equally challenging — I had to lower my camera equipment to the ground, using my hiking stick and some carabiners. Peek-A-Boo is a real treat, once you’ve gotten into it. Unlike Spooky, you won’t find a flat floor here. There are huge potholes to navigate, and you’ll have to squeeze through one tight spot after another. It’s all been eroded into shapes that you’ve never seen before. And if you look up, you’ll notice several natural arches. I didn’t get very far into Peek-A-Boo, before giving up. For one reason, it was a lot of work, and I didn’t have enough time to properly enjoy it. Another reason: I could hear other voices in the canyon. They sounded very close, as if they were just around the next corner, and they were struggling to get through. I figured there was no point of going further, just to run into a group of hikers headed the other way. Plus, I still had to hike back (uphill), drive another 26 miles on Hole-In-The-Rock Road, then another 60 miles on U-12 to get to my stopping-point for the night at Torrey. I had hoped that allowing a full day for fun along Hole-In-The-Rock Road would be plenty, but now I know it wasn’t enough. TIP: There is a third slot canyon nearby, called Brimstone. I didn’t have time to find it or explore it. You’ll find it down the canyon from the other two slots, and from what I’ve read, it can be a little more difficult to negotiate, and occasionally has some pools of standing water in it. Spooky Gulch and Peek-A-Boo Gulch are two great slot-canyons, that are worth exploring. Make sure you’re prepared for the (hot and dry) hike into, and out of, the Dry Fork canyon. Also, be prepared to squeeze through some tight spaces. As a reward, you’ll enjoy some great photographic opportunities. The trailhead to Peek-A-Boo and Spooky Canyons is located on a side-road off of Hole-In-The-Rock Road in Grand Staircase-Escalante National Monument, in southern Utah. To get there, drive 5 miles east of Escalante, Utah on U-12, then turn south on Hole-In-The-Rock Road. Drive 26 miles, then watch for a side-road that splits off to the left, marked as Dry Fork of Coyote Gulch. After another 1.5 miles, this side-road will dead-end at a parking area near the trailhead. Hole-In-The-Rock Road is well-maintained and usually smooth (aside from some washboarding), from U-12 to the side-road. The side-road should also be passable in a standard car, although you may encounter more sandy spots. Just keep moving at a moderate speed, and you shouldn’t get stuck.